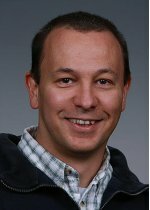 In August 2013, Dr. Bora Akyol was named an Institute of Electrical and Electronics Engineers Senior Member, the highest grade for IEEE members. To achieve the upgrade, Bora demonstrated significant performance in his scientific field, earning recognition from his peers for technical and professional excellence. Before joining PNNL in 2009, Bora was a technical leader at Cisco Systems, where his work involved service blades for the Catalyst 6500 Series switches, 1250 and 1140 Series 802.11n access points, and Internet Key Exchange and Internet Protocol Security protocols, as well as next-generation, identity-based networking products. He has published two Internet Engineering Task Force (IETF) Requests for Comment and holds 15 patents in the areas of wireless and Ethernet networks, network security, congestion control, and software engineering. He is a longtime active member of both IETF and IEEE. At PNNL, Bora is a senior research scientist in CSMD's Data Intensive Scientific Computing group, conducting research and development in network security, information sharing protocols, and Smart Grid. He also serves as cyber security lead for the Pacific Northwest Smart Grid Demonstration project. He earned both his MS and Ph.D. in electrical engineering from Stanford University.